The EuroScience Open Forum 2016 (ESOF16) was held this year in Manchester. While hundreds of seminars, workshops and debates on the latest scientific and technological topics took place in the conference venue, an inspiring science festival of activities and events was developed to bring science alive in the city and engage the whole community. The key themes of the ‘Science in the City’ festival were “Science Feast”, “Science of Me”, “History of Science”, “Building Something Impossible”, “Big Science Stage” and “Tiny Science”. In this context, we were invited to take part in a public engagement event funded by the research programme initiative ‘Marie Sklodowska-Curie Actions (MSCA)’ of the EU Commission. The idea was to create a special two-day event for children and their families named ‘Science is a Revolution’ on the weekend preceding ESOF16 at the Museum of Science and Industry in Manchester. Amongst the 8 topics of the event, we contributed to 3 workshops, namely ‘nanomedicine’, ‘graphene’ and ‘microscopy’. Using interactive and engaging ways to talk about science and research processes, our event provided a unique opportunity for visitors to meet and talk to researchers from different disciplines. Hands-on experiments and fun-learning activities for the whole family were developed to illustrate how science, engineering and technology are changing our lives and shaping our future. 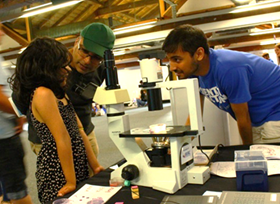 Bringing nanoscience into an exhibition designed for kids was not an easy task. Coming from a lab doing nanomedicine research, we aimed to engage participants with terms like ‘nanoformulation of drug’, ‘targeted therapy’ and ‘personalized medicine’. One of the challenges was to create a series of fun, interactive and educational activities for children of different ages (from 3 and up to 16 years old). Considering that hands-on activities are an ideal tool to facilitate understanding of complex concepts, we developed a series of table-top demos illustrating the invisible nanoscale materials and their use in biomedical research. Lego bricks were used to demonstrate the interaction of a targeting ligand with its antigen, and to build targeted nano-delivery systems. A poster of a human body was also used as target for ‘sticky balls’ in order to explain the concept of ‘targeted’ therapy. Finally, a ‘fish the duck’ game was employed to demonstrate the need of personalized medicine, each duck being cured only by one type of drug regime. For the ‘Graphene’ features and in order to demonstrate how graphene is produced via chemical vapor deposition (CVD), we used plastic molecular models for sp2 carbons. The public was able to grow on the floor the largest CVD graphene lattice possible from few graphene domains prepared for them. Just like in CVD, the coalescence of graphene domains to form a 2 dimensional film led to the creation of defects where graphene grains meet. This allowed us to explain that only the repetition of the hexagonal shape is providing to graphene its unique combination of properties, and to discuss about material quality and characterisation methods. The conductivity of graphene was demonstrated using sketches made by the visitors using either coloured pencils or pure graphite, and revealed by a bright LED lamp that lights up only when the graphite trails were continuous. We used reflective slap bands to illustrate the concepts of wearable electronic, internet-of-thing and connected wearables which might all feature on the list of future graphene applications. At the ‘Microscope’ feature, visitors were shown the principle of cell division using small circle stickers in plastic dishes from the lab. They were then invited to perform cell culture using transfer plastic pipettes and small cell culture flasks, nourishing the mock cells (a.k.a. hydrogel beads) with coloured water. Finally, visitors were able to have a go at an inverted microscope to see the different shape that cells of the body can have. Fibroblasts, macrophages, epithelial cells were used as case studies. In the future, we might try to bring beating cardiomyocytes or ciliated ependymal cells to show how much we can learn from simple microscopic observations. Allowing visitors to become scientists for a day, we showcased what researchers really do for society, increasing awareness of research and innovation activities. Despite being developed for children, the activities were found to be equally interesting and educational by their parents. By providing them with a mock ‘lab book’ which contained illustrations and questions, we prompted family members to work together to answer the questions and gain points in order to get an award. Hopefully some of our youngest visitors have been inspired and will embark on scientific careers, maybe even research. On the occasion of ESOF16, the Royal Society along with national academies across the UK and Europe issued a joint statement about the importance of the international nature of research for nations. The Royal Society concomitantly launched a social media campaign calling research groups to declare online the truly international nature of their teams. A global dimension beyond the EU was definitely present at our event, with no less than 15 nationalities amongst demonstrators. A sense of internationality was also present amongst visitors. During these two days, we engaged with people from the Greater Manchester and met several ESOF16 delegates such as journalists from Russia or France, Greek Minister of Education representative, as well as members of the French team preparing ESOF18 in Toulouse. It gave us the opportunity to talk about nanomaterials not only in English but also in our native or spoken languages. 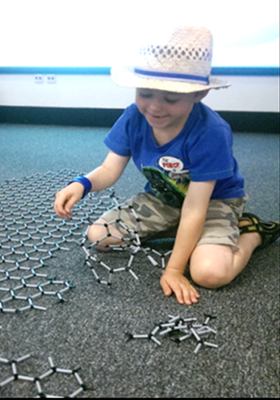 Various public engagement events took place in Greater Manchester during the week of ESOF16. However, it is certain that scientists need to keep reaching out to the widest audience possible. And to do so, they should use all opportunities that are offered to them, regardless of how puzzling some places may initially seem. For instance, during the Science in the City festival, not only trams were used to bring science alive with science buskers talking about astrophysics, but one of the largest shopping centres in Manchester city centre also opened its doors to the “Tiny Science” or “Science of Me” themes. The Science is a Revolution event was funded by the European Commission under the Marie Sklodowska-Curie Actions. The authors would like to also acknowledge the support from the EU Marie Sklodowska-Curie ITN Pathchooser project for MH fellowship and the EU Marie Curie IF career and mobility NanoNeuroHop project for CB. In addition, the authors would like to thank Arya-Marie BA-TRUNG, Policy Officer at the European Commission for organising the event, under the patronage of Patricia Reilly, Cabinet expert for higher education and the Marie Sklodowska-Curie Actions at Commissioner Tibor Navracsics cabinet (Education, Culture, Youth and Sport). This event would also not have been possible without the help of more than 20 scientists from the EU Marie Curie ITN SMART-E project, the EU Marie Curie ITN Pathchooser project, the EU funded Graphene Flagship project, the EPSRC Centre for Doctoral Training (CDT) Graphene NOWNANO, the EPSRC & MRC CDT in Regenerative Medicine, Manchester Cancer Research Centre, The University of Manchester and Salford University; and the friendly team of curators at the Museum of Science and Industry in Manchester. Some of our industrial partners also provided in-kind contributions for the event: we acknowledge the support from Graphenea S.A. (Spain), 2-DTech Graphene (UK), Triple Red Ltd (UK) and ThermoScientific (USA).